Carlo Emilio Bonferroni Carlo Emilio Bonferroni was born in Bergamo on 28 January 1892 and died on 18 August 1960 in Firenze (Florence). He studied in Torino (Turin) held a post as assistant professor at the Turin Polytechnic, and then in 1923 took up the chair of financial mathematics at the Economics Institute in Bari. In 1933 he transferred to Firenze (Florence) where he held his chair until his death. Many further details and bibliography can be found in the obituary of him by Pagni pagni60, and the articles by de Finetti finetti64 and Benedetti benedetti82 (all three in Italian) and my brief encyclopaedia entry dewey98c. He wrote two articles which cover his inequalities, the 1935 article bonferroni35 is directed to a specific application, life assurance, whereas the 1936 article bonferroni36 is more abstract. Note that many sources cite both of these as having been published in 1936, but this is an error caused, I believe, by following secondary sources rather than reading the originals. His articles are more of a contribution to probability theory than to simultaneous statistical inference, and the reader in search of a convenient refernce for such use might prefer the textbook by Miller miller66. A contrasting view of the value of adjustment in multiple comparisons can be found in an article by Perneger perneger98. As usual in statistics the name can be considered inappropriate (an example of Stigler's law stigler80) as the usual statistical simultaneous inference relies only on Boole's inequality seneta93. Apart from these he also had interests in the foundations of probability. Two relevant articles are an inaugural lecture bonferroni27 and a more formal article published earlier, but written about the same time bonferroni24. He developed a strongly frequentist view of probability denying that subjectivist views can even be the subject of mathematical probability. One interesting fact about him is that he produced his own textbooks by handwriting the text (example about 68k) as he believed that books were too expensive for students to buy. C Benedetti. Carlo Emilio Bonferroni (1892-1960). Metron, 40(3-4):2-36, 1982. B de Finetti. Commemorazione del Prof. C. E. Bonferroni. 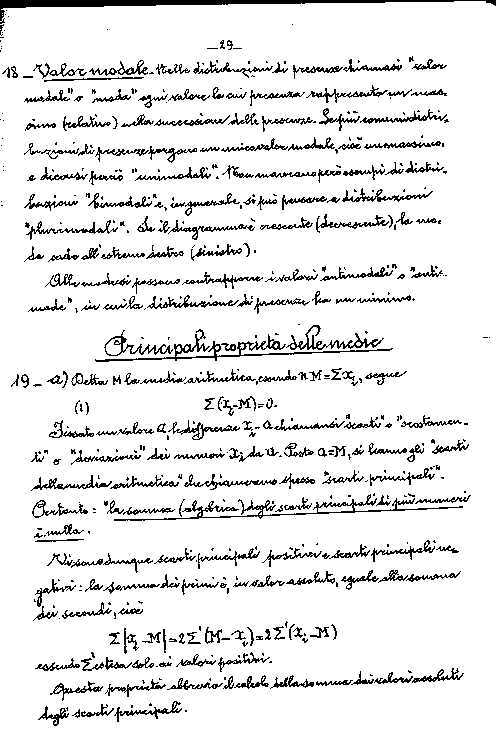 Giornale di Matematica Finanziaria, 46:5-24, 1964. M E Dewey. Bonferroni, Carlo Emilio. In P Armitage and T Colton, editors, Encyclopaedia of Biostatistics, pages 420-421. Wiley, Chichester, 1998. R G Miller. Simultaneous statistical inference. McGraw Hill, New York, 1966. Second edition published by Springer Verlag, 1981. P Pagni. Carlo Emilio Bonferroni. Bollettino dell'Unione Matematica Italiana, 15:570-574, 1960. T V Perneger. What's wrong with Bonferroni adjustments. British Medical Journal, 316:1236-1238, 1998. E Seneta. Probability inequalities and Dunnett's test. In F M Hoppe, editor, Multiple Comparisons, Selections and Applications in Biometry, chapter 3, pages 29-45. Marcel Dekker, New York, 1993. S M Stigler. Stigler's law of eponymy. Transactions of the New York Academy of Sciences, 39:147-157, 1980.